From Science Blogs comes this news about how long term thinking uses separate neural pathways in our brains than short term thinking. So why do people take out sub-prime loans? Don’t they realize that they won’t be able to afford the ensuing 28 years of mortgage payments? I think a big part of the reason sub-prime loans remain so seductive, even when the financial terms are so atrocious, is that they take advantage of a dangerous flaw built into our brain. This flaw is rooted in our emotional brain, which tends to overvalue immediate gains (like a new house) at the expense of future costs (high interest rates). Our feelings are thrilled by the prospect of a new home, but can’t really grapple with the long-term fiscal consequences of the decision. Our impulsivity encounters little resistance, and so we sign on the bottom line. We want the house. We’ll figure out how to pay for it later. The best evidence for this idea comes from the lab of Jonathan Cohen. Cohen’s clever experiment (PDF) went like this: he stuck people in an fMRI machine and made them decide between a small Amazon gift certificate that they could have right away, or a larger gift certificate that they’d receive in 2 to 4 weeks. Contrary to rational models of decision-making, the two options activated very different neural systems. 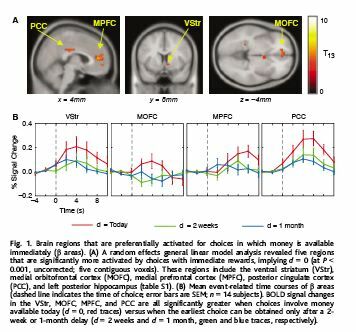 When subjects contemplated gift certificates in the distant future, brain areas associated with rational planning (the Promethean circuits of the prefrontal cortex) were more active. These cortical regions urge us to be patient, to wait a few extra weeks for the bigger gift certificate. On the other hand, when subjects started thinking about getting a gift certificate right away, brain areas associated with emotion – like the midbrain dopamine system and NAcc – were turned on. These are the cells that tell us to take out a mortgage we can’t afford, or run up credit card debt when we should be saving for retirement. They are our impulsive pleasure seekers, the hedonists inside our head.